With Tosca (Kaufmann, Harteros), Agrippina (DiDonato), Iolanta (Anger, Kränzle), L’Orfeo and The Nutcracker at the Palais Garnier. Tours of the Louvre, the Musée d’Orsay, the Rodin Museum and a day trip to Giverny. We want you to fall in love with Paris—whether it be for the first time or all over again. So an extended stay from a base on the Left Bank, performances that feature Jonas Kaufmann, Anja Harteros and Joyce DiDonato, and some of the finest art, cuisine and wine in the world should do the trick, no? Creating a comprehensive survey of the countless collections of artistic masterpieces and public spaces here in a seven-night stay is a challenge. We have developed an essential, yet relaxed and engaging itinerary of expert-guided private tours to complement a superb slate of performances in three venues. Our hotel will be the hidden gem Madison Hôtel on the storied and vibrant Saint-Germain-Des-Prés. Upon arrival, you are met and transferred to the charming Madison Hôtel, our 4-star accommodation on the famous Saint-Germain-Des-Prés. We have secured Superior rooms for singles and Privilege rooms for couples. This evening we meet for a Welcome Dinner atop the Eiffel Tower at Restaurant Jules Verne, with unforgettable views over the entire City of Light. After breakfast, we meet in the hotel lobby for a walking tour on the Left Bank, starting at the 6th-century Benedictine Abbey of Saint-Germain-des-Prés (where René Descartes is entombed), and ending at the awe-inspiring Notre-Dame Cathedral. Lunch is included at À la Biche au Bois. 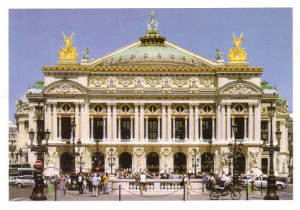 Tonight we enjoy a performance of Iolanta (Hanus; Anger, Kränzle) and The Nutcracker at the Palais Garnier. This morning we visit the superb Musée d’Orsay. Our private, art historian-led tour surveys the museum’s masterpieces, with works by Degas, Monet, Manet, Renoir and Van Gogh, amongst others. Lunch is at the hidden gem (and Michelin-starred) Les Climats, near the museum. This evening we take our seats at the Bastille for Puccini’s Tosca featuring the other-worldly pairing of Jonas Kaufmann and Anja Harteros. The entire day is at leisure to explore the wonders of Paris on your own. We suggest a visit of the Marmottan Monet Museum, the Pompidou or the Branly, or the impressive and manageable Petit Palais Museum. The city is your oyster, and you may wish to simply wander, shop or people watch from a Left Bank café. This evening we meet for a special dinner cruise on the Seine. In the morning we drive to the village of Giverny in the Seine Valley to visit the tranquil home and garden of Claude Monet. Lunch is included at the Michelin-starred Le Jardin des Plumes. Afterward, we wind our way back through the beautiful countryside, arriving in Paris late afternoon. Enjoy the evening at leisure. This morning we visit Les Invalides, where we see Napoleon’s tomb, and then the Rodin Museum, where we take time to explore the sculpture garden and also visit inside. Lunch is included at Café Trama. In the evening we transfer to the Théâtre des Champs-Elysées for a concert performance of Monteverdi’s L’Orfeo (Toro). This morning we depart for a tour of selected masterpieces at The Louvre. Lunch and the final afternoon are at leisure. Tonight we transfer once again to the Théâtre des Champs-Elysées for a concert performance of Händel’s Agrippina, featuring Joyce DiDonato, Luca Pisaroni and Franco Fagioli. Farewell Dinner is included afterward at the elegant Maison Blanche. Return flights should be booked to arrive in Paris early afternoon (latest) on May 23 with departure on the morning of May 30.